Robust, high-quality U.S. made magazines in blued carbon steel and stainless steel for 1911 Auto pistols chambered in a variety of calibers. Choose from round or flat steel followers, both designed to give positive last-round feeding with all bullet types, including wadcutters. Safety orange nylon follower is concave to hold an additional round. Removable – Steel plate detaches for easy internal cleaning of mag; also accepts Bumper Pads. SPECS: Blued carbon steel (Blue) or natural-finish stainless steel (Stnls). Approximately 5" (12.7cm) long. Followers – Stainless steel, natural silver or black finish, flat or round contour. Some magazines have concave safety orange nylon follower. U.S. robusta, di alta qualità fatto scomparti in acciaio inossidabile e acciaio al carbonio brunita per 1911 automatico pistole camerate in vari calibri. Scegli tra seguaci in acciaio piatto o rotondi, entrambi progettati per dare l'ultimo turno positivo alimentazione con tutti i tipi di proiettile, compreso wadcutters. Seguace di sicurezza in nylon arancione è concava per tenere un turno supplementare. Rimovibile – piastra in acciaio si stacca per una facile pulizia interna di mag; accetta anche paraurti pastiglie. Specifiche: carbonio brunito in acciaio (blu) o in acciaio inox con finitura naturale (Stnls). Circa 5"(12.7 cm) lungo. Seguaci – In acciaio inox, argento naturale o nero finitura, piatta o rotonda contorno. Alcune riviste hanno seguace di nylon arancione concava sicurezza. Prodotto di qualità straordinaria, risolti tutti i problemi di ciclo delle 1911 in 9mm, come Colt, Kimber, Springfield, STI, nessun malfunzionamento con canne rampate o sprovviste di rampa, in gara si comportano egregiamente. I have been messing around with 1911 9mm for nearly 10 years in IDPA. I have tried them all, Wilson, Colt, and the "front dent" Metalforms and this without a doubt is the ONLY mag to use for ESP! The Metalform folks did it right. Have tried many but this is the best. Loads all 10 rounds easily and the bullets never "nose dive" causing a jam. Will order 2 more now! Several hundred rounds through each of my three 10 round mags without a hiccup. Perfect for IDPA or IPSC. Seated happily every time, even during competition. Base is just the right height to keep the mag from hitting/breaking the ejector even on the hardest of reloads. Surprised by these inexpensive mags. Not a single feed issue. They are a bit hard on the fingers after feeding several mags. The base pad is perfect for magwells. These magazines are great. Quality construction. i would buy again and again. 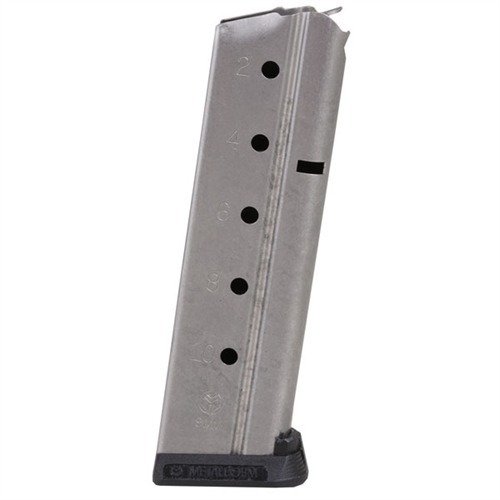 I have used three of these magazines in a Dan Wesson Pointman 9. I have had multiple feed problems using all three of the Metalform magazines. Used them in two USPSA competitions and defensive pistol classes. More misfeeds than I have ever had with any pistol/magazine combination, using Kimbers and Dan Wesson Pistols. When fully inserted into the magwell, the magazine is loose with about a millimeter play. I have used Dan Wesson and Wilson Combat magazines without feed issues in the same pistol. Based upon the other reviews of this product on this website, I'm guessing that it is a firearm manufacturer or caliber specific problem. Would not recommend these magazines in this caliber for Dan Wesson products. I bought four of these for my new Springfield Armory 1911-A1 and none of them fit correctly. They were so tight in the gun that I had to force them out. The two factory mags dropped free and were even a little loose when seated. I returned them for exchange. My wife and I both have Springfield 9MM 1911 A1s and I origionally tried 4 magazines. We both use the magazines and have absolutely no problems! They are not too tight & drop right out of the gun. We have had no malfunctions. I was so pleased I ordered another 4 magazines. We both have other 1911 .45 handguns and have had various success with both the OEM magazines and other non OEM magazines so I was pleased these magazines have worked out so well. NONE of these dropped from from the gun when released. One had to be forced INTO position. Unfortunately, becuase otherwise the materials and construction are solid. Will not fit Taurus 1911 9mm. Factory mags glide in and out. This mag did not fit at all at fist. There was a high spot in the Taurus the kept the factory mags from rattling. After filing down the high spot slightly the mag made it to the mag catch and stopped. I needed to press the mag relies to get the mag filly seated. Then the mag would get caught up on something else on the way out. I don't know if this is a testament to Taurus quality or Metalform. Built a Custom 1911 in 9mm for myself and these magazines function and fit perfect. Not much to say these mags work. This magazine works flawlessly in my Colt 9mm XSE. Very easy to load all 10 rounds in this magazine (even the 10th round!). I have not experienced any misfeeds, or any malfunctions of any type. I bought two of these needing 10 rounders for an upcoming match and no one had other major manufacturers in stock. The good: they hold 10 rounds and fed all the rounds reliably with no jamming/misfeeds etc. One always fails to lock back on empty, the other fails 50% of the time. The issue is the follower slips up past the slide stop rather than pushing up the slide stop. The additional downside of this is the magazine then won't drop free without a tug as the follower condition results in lateral pressure from the slide stop against the side of the follower holding the magazine in the gun. I thought perhaps it was increased spring pressure of the 10 round magazines but I measured the force of the spring pressure using my trigger gauge and when empty, it actually has 3/4 to a full pound LESS spring pressure than the stock SA magazines. I can replicate the behavior even just inserting an empty magazine into the gun and the follower slips past the slide stop. None of my other magazines have any issues. I suppose I'll keep them (and mark them) for malfunction practice, but I don't recommend them. I have a Dan Wesson Guardian 1911 9mm. I bought this Metalform mag to try. I shot 238 rounds out of it today - FLAWLESS performance. I prefer this over the Checkmate stock mags which required some 'tweaking' to work properly. However, out of the package the Metalform was perfect. I was able to load a full 9 rounds + 1 in the chamber and the feeding is smooth. These mags work great in my 9mm PARA Expert, model 96749. I plan on ordering a couple more, although I would rather just as soon have the less expensive blued mags which were out of stock when I ordered these. I bought three for my Taurus 1911 9mm and after +600 rounds... the performance was excellent. I have been using these Metalform 9mm magazines for years in my Colt 1911 9mm, I would say that anyone that needs a 9mm magazine for their 1911 that is one to buy. I have never had any issues with feeding with these magazines at all. I have tried other mags that claimed to work in the STI Duty One 9mm. They all had problems with fit, feed or eject. This one works great. No problems whatsoever. It works better than the original and looks better in the weapon. I am VERY happy I found it. Bought 6 of these for my 1911 Les Baer. NONE of them function in my gun. Springs are to weak to eject from gun. Garbage!!! I bought 2 of these for my RIA 9mm. First of all, neither would fit in the gun. One would insert, but became very tight and had to be forcibly removed from the gun. The other wouldn't insert at all. Got about 1/2 way in and stopped dead. Liberal use of sanding on high points eventually got them to fit, but function was spotty. Rounds nose dive into the feed ramp and jam the pistol. Especially if loaded to capacity. Misfeeds. And one of them won't lock the slide open on the last round. The spring appears to be week and won't hold the slide stop up. Every other brand of magazine I've tried in the gun work perfectly, with Cobra mags being the best of the lot. i bought 3 of these for my RIA 1911. when i first used them they wouldn't drop free when released. i found that they bound slightly against the release button, so i tapped the throat with a plastic mallet to remove a slight flare and they work perfectly now. My father gave me his 1911 Colt MK IV / Series 70 Government Model 9mm and I wanted to start shooting it, but I needed magazines as it came with only one. I looked high and low and found these. I bought 15 and the range time is great. Not Colt brand, but work nice. Now if only I could finjd some power to reload. Bought two blued magazines for my new Springfield Range Officer 9mm along with bumper pads to help with proper magazine seating in competition shooting. The two holes on the removable base of the magazine are not in the same location to allow the bumper pad to fit with the bottom. The holes are drilled 1/8" too far forward. In addition, the bottom plate is not completely flat so the bumper pad does not fit solidly when screwed on. The standard 1911 mags for the Springfield fit the bumper pad fine. The MetalForm magazine holes need to be re-drilled in the proper location in the bottom plate for a proper fit. The removal of the bottom plate for cleaning is also a definate challenge, as the parts do not fit well together with the spring base plate. I will be attempting to return them to Brownell's without even trying them with my Springfield. lo uso continuamente in allenamento ed in gara da piu di un anno, problemi zero. Parti Fabbricante: 9743 Robusto, alta qualità made in USA riviste in acciaio brunito acciaio al carbonio e acciaio inox per 1911 automatico pistole camerate in una varietà di calibri. Scegli tra seguaci rotondi o piatto d'acciaio, entrambi progettati per dare l'ultimo turno positivo che si alimenta con tutti i tipi di proiettile, tra cui wadcutters. Seguace di nylon arancione di sicurezza è concava per tenere un turno aggiuntivo. Rimovibile – piastra in acciaio si stacca per una facile pulizia interna di mag; accetta anche pastiglie paraurti. Robusto, alta qualità made in USA riviste in acciaio brunito acciaio al carbonio e acciaio inox per 1911 automatico pistole camerate in una varietà di calibri. Scegli tra seguaci rotondi o piatto d'acciaio, entrambi progettati per dare l'ultimo turno positivo che si alimenta con tutti i tipi di proiettile, tra cui wadcutters. Seguace di nylon arancione di sicurezza è concava per tenere un turno aggiuntivo. Rimovibile – piastra in acciaio si stacca per una facile pulizia interna di mag; accetta anche pastiglie paraurti. Parti Fabbricante: 9273 U.S. robusta, di alta qualità fatto scomparti in acciaio inossidabile e acciaio al carbonio brunita per 1911 automatico pistole camerate in vari calibri. Scegli tra seguaci in acciaio piatto o rotondi, entrambi progettati per dare l'ultimo turno positivo alimentazione con tutti i tipi di proiettile, compreso wadcutters. Seguace di sicurezza in nylon arancione è concava per tenere un turno supplementare. Rimovibile – piastra in acciaio si stacca per una facile pulizia interna di mag; accetta anche paraurti pastiglie. Parti Fabbricante: 9773 U.S. robusta, di alta qualità fatto scomparti in acciaio inossidabile e acciaio al carbonio brunita per 1911 automatico pistole camerate in vari calibri. Scegli tra seguaci in acciaio piatto o rotondi, entrambi progettati per dare l'ultimo turno positivo alimentazione con tutti i tipi di proiettile, compreso wadcutters. Seguace di sicurezza in nylon arancione è concava per tenere un turno supplementare. Rimovibile – piastra in acciaio si stacca per una facile pulizia interna di mag; accetta anche paraurti pastiglie.